Ride Hailing In Rural America: Like Uber With A Neighborly Feel : All Tech Considered A small startup called Liberty Mobility Now is staking itself as the Uber of rural America. But to find its niche there, it has had to adapt everything from its app to its driver training. Shelia Mendoza says she's not looking for a livelihood out of Liberty Mobility, but a little extra cash and some new friends to talk to. It's easy enough for people who live in cities to hail a ride, either from a taxi or a service like Uber or Lyft. There's plenty of demand, and plenty of drivers. A startup is trying to bring a similar service to rural America, but it has required some creative thinking. The town of Van Wert sits on the western edge of Ohio. It's a stretch of flat farm country punctuated with grain silos and a stone castle that's listed as the nation's first county public library. It doesn't seem like the first place a ride-hailing service would likely come. But Erica Petrie says maybe that's a mistake. Petrie is the mobility manager of the seven-county Area Agency on Aging. 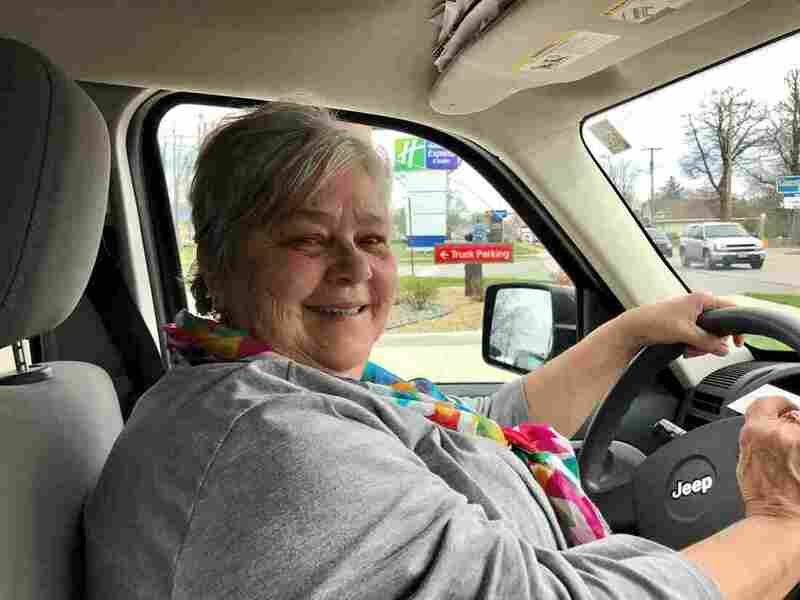 Her job is to find transportation options in Van Wert, which has no buses, one cab and a lot of needs. "The quick turnaround needs: 'Can someone help me get to the doctor?' We see short-term needs: 'Normally I'm able to drive, but my car's in the shop,' " she says. So Petrie helped recruit Liberty Mobility Now to Van Wert. The startup began in Nebraska about two years ago and has expanded to Texas and Ohio. It's also on its way to Colorado. Founder Valerie Lefler grew up on a dairy farm and worked on rural transportation issues at the University of Nebraska. She created Liberty as a business, but she talks about it as a mission — one requiring drivers to do more than leave customers at the door. "We really look for folks who are altruistic, that would want to do this anyway because that's what they would do for their best friend or their own mother," Lefler says. One of those people is Shelia Mendoza, whose mission in life, she says, is to be a grandma. Mendoza has worked for a dry cleaner and at a Wal-Mart. She's sold insurance, made RV cabinets and briefly ran Shelia's Cornucopia Cove. And when Liberty came to Van Wert two months ago, she was one of about a dozen drivers recruited and trained. The grandmother of 17 and self-described talker was a natural. That's because while part of Liberty's model is built on an app designed to work in rural geographies, much more of it is built on relationships. For example, Mendoza developed a relationship with her first customer who'd lost his license but found a job: the midnight shift at a meat processing plant. A county agency was willing to cover transportation costs for a few weeks until he could get his license back. "I always had him there five to 10 minutes early," Mendoza says. "We would stop and get coffee sometimes ... before he would go to work. Once in a while he paid for mine." Since he regained his license, things have slowed down for Mendoza. "I was happy he got his car, I was happy he got his license. He's a better person for that because I know he hated getting hauled around by an old lady," she says and laughs. She's hoping business will pick up, and her hopes rest with a lower-tech option Liberty is launching: a call center for those who don't or can't use an app. "I've heard a lot of people say, 'Well, I don't want nothing like that on my phone; I don't have room,' " she says. Scott Bogren of the Community Transportation Association of America, which specializes in smaller and rural transportation issues, says the call center shows that Liberty understands its target community. "The adult children of these seniors who can book rides for mom — they're going to use an online service," he says. "And combine that with the ability for mom to call in and talk to somebody that she can get to know — there's the sweet spot." Because of chronic transportation needs, Liberty is partnering with United Ways, hospitals, health departments and other social service agencies. Rides cost $1.25 to book and $1 per mile. The fees are a small fraction of what the cabby charges, but Liberty says it will also make referrals if the taxi's a better fit. Petrie says all of that captures the spirit of the area. "I like that the drivers are from the communities," she says. "People are I think more polite, more neighborly. That's just what is going to fit here." Liberty Mobility is hoping to find similar fits all across America. M.L. Schultze is a reporter with NPR member station WKSU. You can follow her @MLSchultze.